Highway Code rules 18 to 30 cover rules for using pedestrian crossings and islands, and rules 191-199 cover rules for drivers using crossings. Don’t park on a crossing or in the area covered by the zig-zag lines, and don’t overtake near a crossing whether the vehicle is moving or has stopped at the crossing. If there’s a queue of traffic your vision might obscured. Pedestrians might be crossing between stationary vehicles. Keep crossings clear, even if there’s a queue of traffic. Blocking crossings makes it difficult for disabled people to cross, and also puts your vehicle at risk of minor damage if pedestrians are filtering around it. Allow pedestrians enough time to cross; don’t rev your engine or pressure them to move faster. look out for pedestrians waiting to cross and be ready to slow down or stop to let them cross. You should be able to tell from their position and body language that they are waiting. be aware of pedestrians crossing from the right, even if there is a pedestrian refuge/island. If you are at a pelican crossing, you will get a flashing amber signal after the red stop light. You must give way to pedestrians on the crossing when the signal is amber. If there are no pedestrians when the signal is flashing amber, you can proceed if it’s safe to do so. At a toucan crossing there’s no flashing amber signal so you must wait until your light turns green before you can proceed. 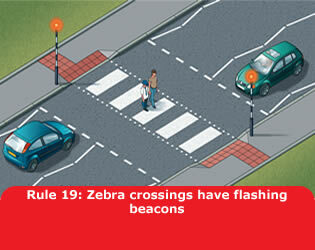 In any crossing, if your lights turn green but there are still pedestrians on the crossing you must give way to them. If you are a pedestrian you should not assume that vehicles will see you or stop, especially if visibility is poor, therefore always wait until vehicles have stopped before starting to cross. Always cross between the studs or over the zebra markings. Crossing at the side of the crossing can be dangerous as high-side vehicles can obscure other vehicles like cyclists or motorbikes filtering through. Zebra crossings have flashing orange Belisha beacons. Don’t assume traffic will see you waiting at the crossing. Try not to wait standing directly behind the beacon pole as this reduces drivers’ visibility of you. When drivers have stopped from both directions, you may cross. Traffic does not have to stop until someone has moved onto the crossing, so be sure to clearly indicate your intention to cross. Try to avoid loitering around the crossing points if you do not intend to cross. As a driver, watch out for pedestrians’ body language to see if it looks like they want to cross. 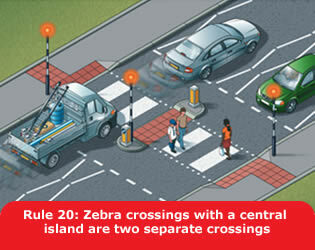 If there’s an island in the middle of a zebra crossing this is treated as two separate crossings. As a driver you do not need to wait until the crossing is clear before you can move off. Pedestrians can wait in the centre island until it is clear to cross the second half of the crossing. 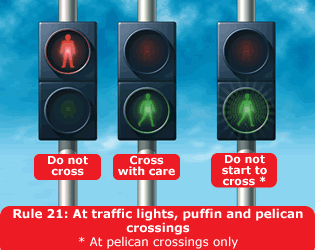 At traffic lights, puffin and pelican crossings there may be signals for pedestrians. Only cross when the green man shows. Don’t start crossing until all traffic has stopped. Remember that there might be lanes in which traffic might be allowed to move, for example, when turning a corner. At some crossings there might also be an audible cue and tactile paving for blind pedestrians. Pelican crossings are signal-controlled crossings operated by pedestrians by pressing a control button to activate the signal. When the green figure illuminates check traffic has stopped before starting to cross. When the green light begins to flash, don’t start a crossing. Puffin crossings are slightly different in that the red and green figures are just above the control box on your side of the road and there is no flashing green phase. 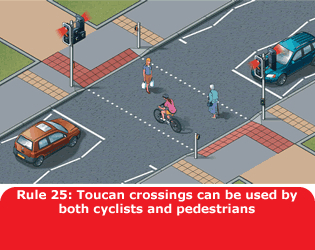 Toucan crossings are like pelican crossings but for cyclists, too. 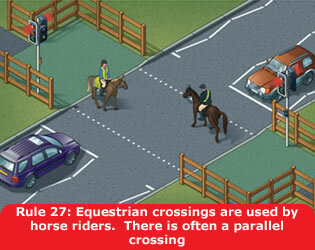 Equestrian crossings are for horse riders and have wider crossing spaces, horse and rider figures in the light and a higher set of controls to enable mounted riders to reach them easily. Staggered pelican or puffin crossings are designed to prevent pedestrians from running across both sides of the road in one go. They are often found on multi-lane carriageways, or where one side of the carriageway is on a different traffic light phase from the other side. 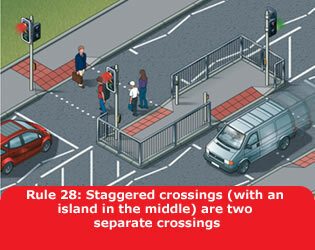 They should be treated as two separate crossings. There are other crossings that are controlled by an authorised person such as a police officer, traffic warden or school crossing patrol. All the questions in the Highway Code theory test regarding pedestrian crossings can be found here.